Please Note: Daly Creek Winery is closed for business and will not be a stop on the wine trail. 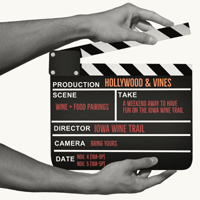 The Iowa Wine Trail is rolling out the red carpet for our first ever “Hollywood and Vines” wine and food event on the weekend of November 3-4. We love the movies and each one of our eleven wineries has selected a film as their inspiration for a wonderful wine-food pairing! Brick Arch: Love, ActuallyToad in the Hole (served with Uncommon Red and Tire Swing), Country Pork Stew (served with Honey Bee (Brianna)), and English Trifle(served with Uber Cherry). Grinch Dessert paired with Autumn Splendor, a double gold medal winning Blackberry dessert wine infused with Chocolate flavor – a very special wine and an Autumn treat . At each winery wine lovers will be able to enjoy specially prepared (and Hollywood film inspired) foods paired with award winning, locally crafted wines. Plan to sample the food and wine at each of the Iowa Wine trail wineries. More Fun: We encourage you to dress up as one of your favorite characters (from the above listed movies) for a chance to win free tickets to a future event. (note: maximum of 4 tickets to be given away). Christmas Movie Costume Contest - dress up in your favorite Christmas movie character and post a photo yourself on our Iowa Wine Trail Facebook page (tag yourself and include the hashtag #iowawinetrail) and let the “People’s Choice” contest begin. Post by November 11th - the Fall event ticket winner will be announced on by the end of November. More Prizes! Make sure to fill out the questionnaire (a link we’ll post on our FB page and in our newsletter) to win a chance at gifts and to be entered to win one of ten $25 gift certificates. Remember you are not required to visit each of the winery to enter. GET YOUR HOTEL (or B&B) Reservations before it's too late and plan to join us on November 3-4, 2018 for the most fun event of the fall season – HOLIDAY & VINES: Special Christmas Movies Edition! At each winery, adventurous wine tasters will be able to sample amazing foods perfectly paired with delectable, locally crafted wines. Plan to sample the food and wine at all eleven wineries. Purchase tickets via PayPal (click on Events tab, and then on “Purchase Tickets” tab). Please note there is a $3 PayPal transaction fee; however, you can avoid this fee by purchasing your tickets directly at your favorite Iowa Wine Trail winery. · Large groups (e.g., bus groups and tours should contact us prior to booking). · Print receipt and bring to event. · At first winery, present receipt and you will receive: a) tickets, b) glasses, and c) wrist band. EARLY BIRD SPECIAL – Buy Early and Save! Purchase 3 tickets before October 24, 2018 (by 7pm) and get the 4th one FREE! After October 24th tickets will be $35 each up until the day of the event. Tickets will be priced at $40 each on the day of the event. Ticket prices are $35 each in advance (purchased before October 31, 2018) or $40 the day of the event. Free Designated Driver tickets are available upon request. ONLINE TICKET OFFICE CLOSES: October 31 (at 7pm) – after that tickets will be available to purchase at Iowa Wine Trail member wineries. Tickets can be purchased at participating winery tasting rooms, online by clicking on the Purchase Tickets tab or by calling 563-557-3727. 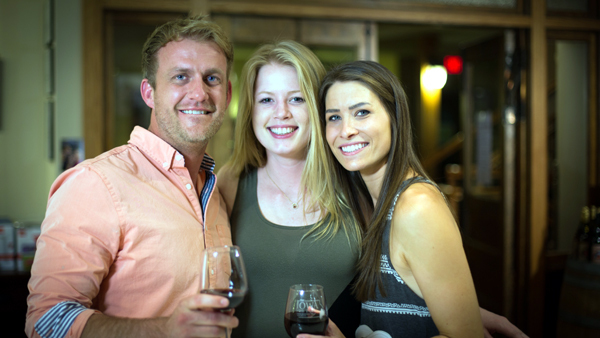 · Explore - Taste - Enjoy the Iowa Wine Trail. · Remember: You need not visit every winery on the trail to get a chance to win a $25 certificate. Simply complete your ticket postcard and leave it at the last winery you visit. NOTE: We encourage our weekend visitors to secure overnight accommodations early because space is limited and hotels fill quickly.